Ratatouille is one of those things that can be really good or really bland, I find. I got it right this time, so I’m writing down what I did before I forget. 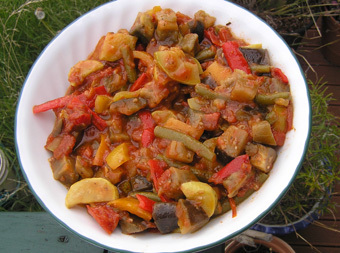 Also, I have to mention just in passing that I got part of my method from a character in a novel by Elizabeth Bear, who cooks a batch of ratatouille with great care as an act of kitchen magic. I figured that if the method worked so well that you can do spells with this dish, it might also work to get flavour into it. And it did. Although the recipe looks long, I think it took me about 45 minutes from start to finish, including the time for the eggplants to release their juices. So it isn’t too time consuming, I promise. Also, I am being very vague about amounts of things like oil and spices and herbs. This is partly because I think that flavours of these kinds are very much a matter of taste, and partly because I know some people prefer olive oil spray etc, but mostly (I cannot tell a lie) because I actually have no idea how much I used. I suspect it was a good teaspoon or so of the lavender salt, a couple of pinches of the fennel, chilli, salt and pepper mix, and half a teaspoon or so of the mint, but don’t quote me on that. I probably used about 4 – 6 tablespoons of olive oil, but it could have been less – I tend to just go once around the pan whenever it needs it, and don’t keep track. Olive oil. Quite a bit, really. Cut the eggplants into large dice, and put into a large colander, sprinkling salt over each layer. Leave to drain for ten minutes while you start preparing your other vegetables. Cut the peppers and capsicums into strips. Cut the zucchinis in half lengthways, and then into slices. Chop the tomatoes roughly. I don’t bother with the whole peeling tomato palaver, but you can if you like. Top and tail the green beans, and halve them if they are very long. Crush the garlic. Heat some oil in the biggest skillet you can find (trust me on this) and add the eggplant and the garlic along with the lavender salt. The trick with eggplants is that they do like to drink oil, but if the oil is very hot when they first go in and stays hot, they drink less. Keep them moving in the pan. You can add a little more oil if need be – I did – but only once. Once they start softening and going a bit golden, add the wine, and simmer down until they are nice and soft. You may want to add more lavender salt, especially if you are as addicted to the stuff as I am. Tip the eggplant and juices out of the pan into a large bowl. Don’t be scrupulous about either keeping or pouring out the juices – it’s good to have a little left in the pan when you put the peppers and capsicums in. Drizzle a bit more oil into the pan, bring the heat up again, and add all your peppers and capsicums, along with a little salt, pepper, dried chilli and fennel. Sauté until the peppers are all soft, and then tip into the bowl with the eggplant. Add a bit more oil to the pan and tip in the zucchini and dried mint with a little pepper. Sauté until the zucchini starts to get golden and soften, then add the chopped tomatoes and cook until they start collapsing. Add everything back into the pan along with the passata or pasta sauce and your green beans. Simmer for about 10 minutes, or until the beans are cooked to your preference. This makes enough for at least 8 people, served with bread and maybe some cheese, if you insist. You can serve this at once, but I think it’s nicer if it sits for 20 minutes or so to cool a bit beforehand. It’s also lovely at room temperature or even cold from the fridge. It’s possibly even nicer the next day. In fact, this is one of the best summer dishes ever, because it keeps well and you don’t have to cook it during the hot part of the day. My version has no onions, because I made it for a friend who has an onion allergy, but I believe onions are traditional. I would use a couple of red onions, which I’d probably sauté up first with some rosemary, and remove from the pan before adding the eggplant and garlic. 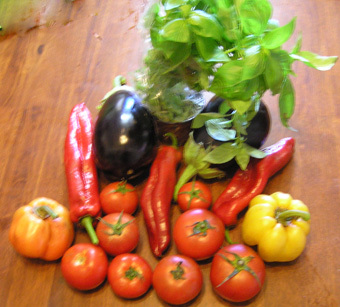 You can pretty much swap a lot of the veggies in or out according to taste, and fiddle with the quantities, though I’m not sure it counts are ratatouille if you take out the tomato and eggplant, so if you are avoiding the nightshade family, you may be out of luck. I’ve also seen people add potato to this (I’d parboil the potatoes and sauté them up early, maybe with the onions) to make it a more complete meal, or you could add some cannelini beans towards the end for protein. 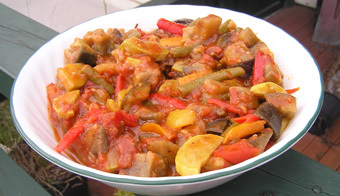 Though eggplant seems to be fairly high in protein and is certainly filling. If you are not vegan or vegetarian, I must confess that this is lovely alongside lamb cutlets or grilled chicken or any barbecued meats. Though we had it with bread and grilled haloumi, which was pretty much perfect. Ah, one of the dishes I never, ever ate growing up, on account of my ma’s allergies which include but aren’t limited to eggplant, tomato, capsicum… 😛 Looks lovely! Thank you! I’m half Italian, and can’t imagine growing up without eggplant, tomato and capsicum… I can’t think of many meals we have regularly that don’t include at least one of those veggies. The title of this post is perhaps a trifle self-satisfied, but I was so pleased with how it tasted! FWIW, this was the first ratatouille I’ve enjoyed eating! Wow, I’m flattered! Thank you! Sounds like a really interesting variation! I’m glad you enjoyed it!